The Sia wallet integrates all of the basic functionality you need in order to operate with the service including the options to create contracts and upload files as well as to access them or to lease your free disk space to users needing such. This means that the wallet needs to be running all the time and that goes as well if you want to be able to mine SiaCoins as well. Currently SiaCoins can be mined using a GPU miner, an OpenCL one that works on both AMD and Nvidia GPUs, though it should be faster on AMD-based video cards. You can expect to get up to about 900 MHs from a Radeon 280X or a GeForce GTX 970 as a reference, but do note that the miner for Sia is also pretty CPU intensive, so if running with multiple GPUs the hashrate may slow down if the CPU gets overloaded. So far the Sia GPU miner needs quite a lot of extra work to become really useful, there are still no pools for SiaCoin mining and you need a running and unlocked wallet on each system you want to mine Sia on. Furthermore you need to run a separate instance of the GPU miner for each GPU you want ot mine the coin with, so with the current network difficulty and solo mining it may take quite a while until you hit a block, making the mining not to attractive. To get to try sharing some files by renting some space on the Sia network you can use a faucet to get some SiaCoins, however it seems that the faucet has some downtime, so alternatively you can purchase SiaCoins from Poloniex where they are traded with a price of 7 satoshi per SiaCoin (pretty cheap). You can see what is the average price per GB per month in SiaCoins in the wallet among the currently active available hosts to get an idea how much you may need to spend depending on your storage needs. So with 200 SiaCoins per GB per month if you need 1TB of storage you would need to pay for it about 0.014 BTC equivalent or a little over $5 USD each month. The service encrypts the files and apparently stores them on multiple hosts in order to ensure availability even if one of the hosts experiences some downtime. The problem here is that managing your files from within the Sia wallet is not the most convenient you would expect, so this is also something that needs work as alternative cloud storage services like DropBox and many others do provide much more convenient access to user’s files. The part where you are Hosting user files and are getting paid in SiaCoin in return is probably what more people are interested in. 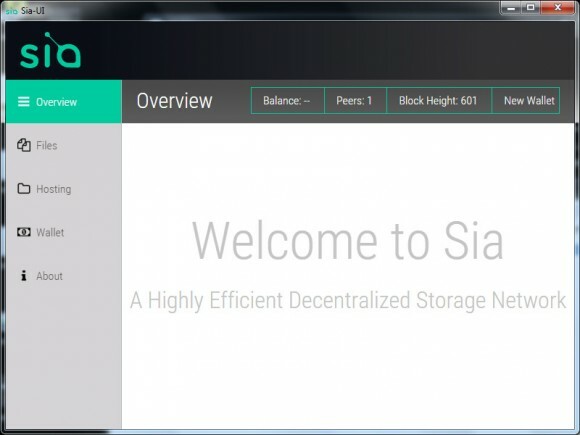 Here you set your price in SiaCoin per GB per month and the amount of free space you want to have available for sale and start waiting for getting contracts from people that need space. Dedicating 100 GB does not mean that they will be instantly filled at the moment even if you set a very low price of just 10 SiaCoins, it is wise to see what is the average price at the moment and base yours accordingly in order to get contracts as well as for them to be profitable. Based on your active contracts you will see what is the expected earnings that you will get at the end of the contract if you manage to fill them in. It is not very clear what level of downtime is acceptable before a contract is cancelled, but restarting the wallet a couple of times did not pose a problem for our few test contracts at a very low price. What is important here for providing Hosting services via Sia is that you need to be able to have your PC running the wallet accessible via an external IP, you can use port forwarding and the wallet supports UPnP as well. Though we’ve had a fair share of issues with connections not going through even though UPnP was working and port forwarding was just fine, leaving the wallet run for a few hours and these have disappeared by themselves. Getting your computer Hosting files on the Sia network accessible over the Internet could cause some issues for novice users and it also makes it hard to run multiple computers sharing free storage from a single external IP.